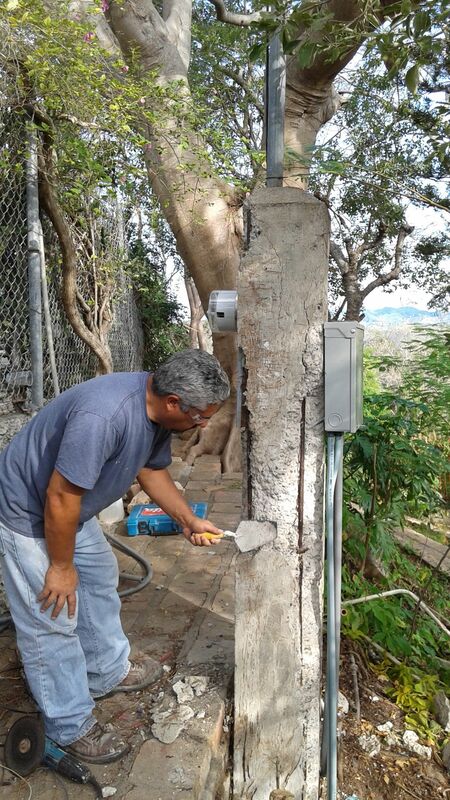 We have been in Ponce for almost two weeks now, and there is still so much to do. Is it raining outside the open dining area? Nope, that’s Estevan power washing the concrete roof (for the second time). We need to go up with 5-gallon buckets of special sealant to weather-proof the concrete, a treatment that is years overdue. I cannot wait. Actually, I have to wait. The electricians are not yet finished with the wiring and the lights on the roof. Saved by the bell. But there’s still the staining to be done. We have gone round and round with various suppliers, trying to get solid-color deck stain that might vaguely match what’s on there now. Language difficulties abound. Even with Allysen doing the talking in Spanish, there is persistent confusion about whether we mean interior stain (which everyone has) or exterior stain (which no one seems to have). No, we do not want it with polyurethane. One can say “exterior” many time before the light goes on. “No, I’m sorry, we don’t have it.” Finally, we establish that Home Depot does have transparent stain that can be colored to barn red. It will be transparent, but it’s better than nothing. Jayce, hours before leaving for her flight, has pitched in to help me get started with decking sections that are new wood and must be protected. 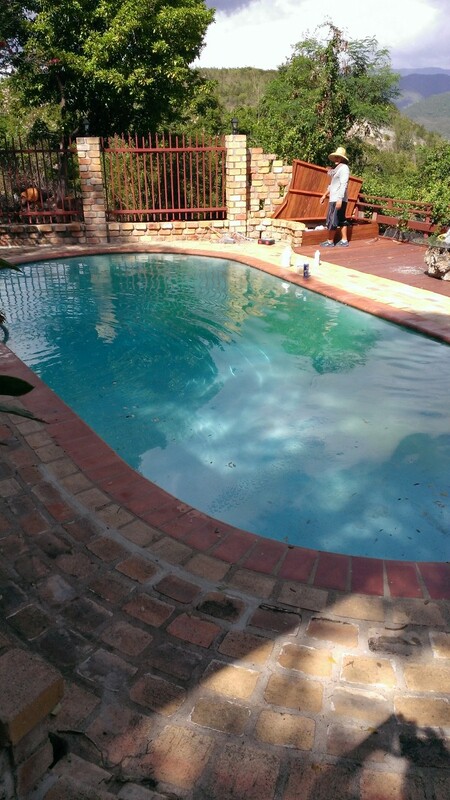 I continue with new railing and some work down on the pool deck. We are all getting very tired. But there is so much left to do! The electrical work should be done tomorrow. But where can we find light fixtures that can stand exposure to wind and damp, and not make Allysen want to throw up at their ugliness? Can we get the plumber back to reinstall the hot water heater in the kitchen that Veronica disconnected and moved? What about the faucets that need replacing? What was the source of the water in the downstairs closet? Many questions remain. It is now Friday, and we are scheduled to fly back at 3 a.m. on Sunday. Freddie and Heri can do some work for us after we’re gone, but there is so much left to do! Still, there is so much we have accomplished. 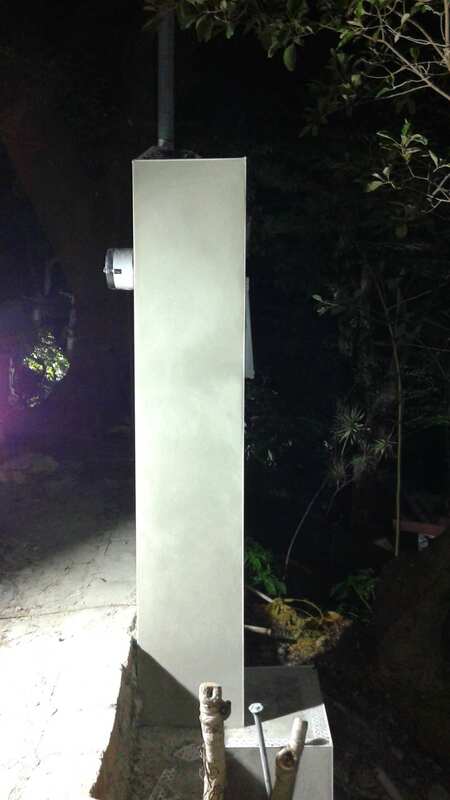 The concrete pillar for the electrical box looks like a brand new obelisk, set down by visiting aliens. The house really looks as though it has been brought back to life. It feels like a miracle. Quite possibly it is a miracle.